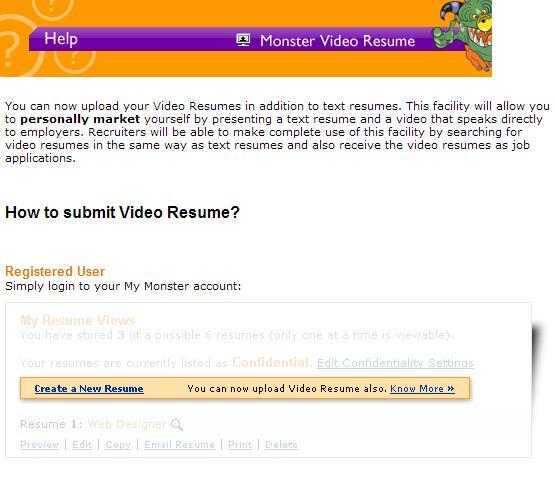 Was visiting the Monster web site to check out some of the recruitment features mentioned by one of their executives. On the homepage, just below the jobseeker’s login, I noticed a link about uploading a video resume. This is a new service being offered, free of cost to job seekers. Monster says the video will be subjected to an auto-check, and will be made live within 24 hrs if there is no objectionable content. In terms of restrictions, the file size can be a maximum of 50 MB large, and 2 minutes long. It seems to be good way for candidates to market themselves, and for employers to get a feel of the candidate, before actually interviewing them. However, in reality I’m not sure how useful this would be in terms of actually shortlisting candidates. Not many people are comfortable in front of the camera, and may come across as somewhat awkward, inspite of several retakes, whereas the opposite could be true in a face to face meeting.